6th August 2009. 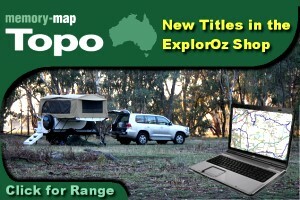 Updated Trek Search and more improvements to iMapPlot; Memory Map now available through the ExplorOz Shop; Pat Callinan's new book and DVD; Members Photo Comp; Poll results and more. Further refinements to iMapPlot have continued this past fortnight focussing mostly in theTreks area. Rather than launch it fully finished, it's a work in progress so as each new feature is designed and tested it will appear for you to start using right away. For example, this week we loaded a new entry page forTreks. All treks can now be searched by clicking route lines shown on a map of Australia, which feature all the official ExplorOz Trek Notes as purple track lines, and all the User plots (previously accessed via PlotSwap) accessible off the map as white track lines (try zooming first). When you click the map, the text panel will show all Treks and plots found in our system. You can also use the Mapping tools to Search by Place Name, Address, or a Lat/Lon position. After you've selected a Trek Note, you'll be taken to the usual Trek Note page. The interactive map has been improved with a few extra nice features but there's more refinements yet to come. Overally, there's too many new features to list here so take a look at how it's coming along. Each day we add further features and refinements - its a work in progress for sure! After selling out due to popular demand, the ExplorOz Sandflag Kits are now back in stock and ready to post to you! We’re also very excited to announce the Shop now stocks the entire range of Memory Map Digital Map DVD’s. These fantastic products are great to just install and go, and so far discs are available covering the following regions: AusTour, QLD, NSW (north and south), VIC (east and west), and TAS. Another new product to reach our shop with tips for both beginners and experienced 4WDrivers, is “Pat Callinan’s Starter Guide”, which also comes with a free instructional DVD! We currently have 5 polls running concurrently, asking you to pick 1 of 3 choices as your favourite trip destination. These 5 polls mean we have 15 regions for you to vote as your favourite. Polls cycle randomly so keep checking the Poll button to ensure you answer them all. Our last poll confirmed you prefer self-guided 4WD adventures than any other trip experience, with only 15% voting for meandering with caravan. This is interesting when the majority of respondents (64%) to an earlier poll said they owned a caravan. This probably indicates that most ExplorOz caravan owners have an offoard van and seek an adventure - so now you know! Even if you're not a Member, no doubt you've noticed the influx of new Blogs appearing in the "Photo Comp" tag. This competition is open until Friday 14th August for Members Only and seeks the best photographic representation of "ExplorOz". Not only will the winning 3 have their photo featured on a unique piece of ExplorOz Memorabilia to be raffled off to raise funds for the St George Scout Group at this year's National Gathering, the member who submits the winning photo, chosen to be the main feature of the memorabilia canvas print, will also receive a professional enlargement of their photo (printed onto a white matt board with foam core backing approx 400mm by 500mm) ready to frame. The 2 runner-ups will each receive an ExporOz merchandise/clothing pack. Everyone is welcome click here to view the entries so far (comp started 29th July so use the calender to go back to view all entries). It's free to use, so give it a go!! 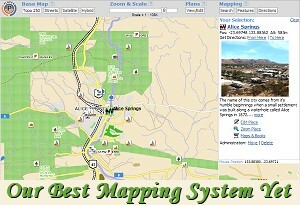 This mapping system is shown in:Places, Treks, PlotSwap, Directions, and Shop products.